During the second half of the nineteenth century, Great Britain was home to some of the greatest preachers, biblical scholars, and Christian writers in all of church history. Legendary names such as Charles Spurgeon, George Müller, Hudson Taylor, Catherine Booth, and George MacDonald stand out as giants of the church. Their predecessors, such as John Wesley and Matthew Henry, left them a rich tradition of biblical and evangelical excellence to follow. Americans R. A. Torrey and Charles Finney and South African Andrew Murray were cut from the same cloth. From the classic writings of these revered saints, Lance Wubbels has edited and compiled the best of the best of their inspirational insights into this 365-day devotional. Verse by verse through the Gospel of John, readers will gain an unforgettable understanding of the life, words, and ministry of Jesus Christ. Here is a one-year devotional that is packed with profound biblical commentary, brilliant wisdom, and practical application that will enrich readers and be read for a lifetime. I don't know how many times in my life have I heard these words on a Sunday: "A reading from the Gospel of John..." So many times! 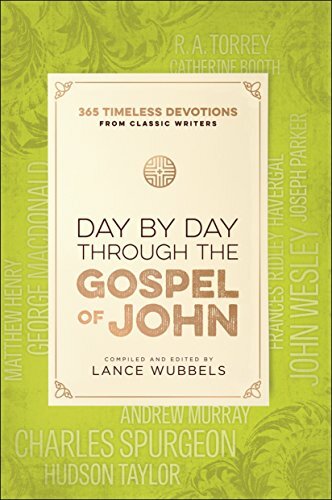 What a blessing to have an in-depth study into the Gospel of John through this day by day devotional edited by Lance Wubbels. This book with words from Charles Spurgeon, Catherine Booth and John Wesley to name but a few is a resource for anyone seeking further study into God's powerful word. This book is not one to be read quickly but to be savored and studied and read yet again. We grow up with these words of wisdom read from a pulpit yet often it is a quiet moment of an evening when we take notice and hear it anew as though for the first time. I recommend this book with 5 stars. I received this book from the publisher with no obligation to review.